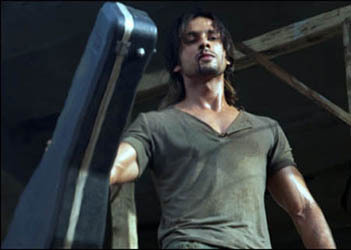 Opinion Poll: Which Kaminey character does Shahid Kapoor act better for? The film’s a complex roller-coaster ride with twists and turns – the structure of Bhardwaj’s screenplay makes it easy to see why he wrote and directed not one, but two adaptations of Shakesperian tragedies: Macbeth (2004) and Omkara (2006). There’s been some rumbling about how the film got an A Certificate (for viewers 18 and up) from India’s Central Board of Film Certification, rather than the U/A (Parental Guidance recommended for youth under 12) that most films aim for to capture the greatest audience numbers. The final version of 2008’s Ghajini, while it had a lot of suggested violence, was toned down to achieve a U/A and paradoxically it’s more gruesome. 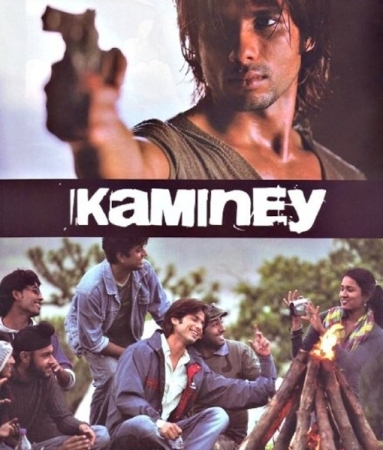 The underlying tale is familiar, as a pair of estranged twins (Sanjay Sharma (“Guddu”) and Charlie, both enacted by Shahid Kapoor), one good and one not-so-good are drawn together by larger forces and forced to reckon with what tore them apart and where they’re going now. The pacing of the film moves everything along at a clip where it’s hard to get bored and sometimes hard to keep track of whom each person is and how they fit into the big picture. That’s not necessarily a negative, but you may want to plan on not blinking. For the most part, the soundtrack, with music direction (and some singing!) by Bhardwaj and lyrics by Gulzar is well executed, understated, and timed to enhance the action. The camera-work keeps things rolling along, lingering on some truly grim settings. From the start there’s a gritty and grainy celluloid quality – even a wedding scene seems less than bright despite the fancy clothes and fairy lights. These are not tales of the ultra-rich and glam – the characters start at the struggling lower-middle class and work their way down to goon. Scenes have a documentary/home movie feel with frames out of focus, and mundane, downtrodden locations. It’s the characters who hold the film back. The script isn’t grounded enough in the main characters’ back-story and the leads aren’t able to convey the depth of their dreams and motivations to render the depth of the losses, no matter who’s left standing at the end. The fast pace obscures the emptiness of the people caught up in scenarios. The journey is full of cliffhangers as we switch from scene to scene, story to story. It’s not that the film isn’t fun and full of action – it’s that ultimately it’s a little vacuous. Priyanka Chopra’s Sweety is the factor that brings the brothers together. Her drab avatar is the sort that Priyadarshan may have envisioned for Laura Dutta in Billu, and here it’s credible. Her outfits are careworn and inexpensive, her makeup and hair un-dramatic. Chopra’s not quite up to the task of conveying the depth missing from the script to show what motivates the brash, often conflicting, things Sweety does. She’ll shoot up the place when provoked but also simper and give in to anything her brother says. She brazenly courts disaster by pursuing Guddu. Following the pattern of chocolate heroes who morph into more “serious” work, Shahid Kapoor may shock you as the flawed twins. His characters beat people up, run around bloodied and unshaven, and resent marriage because it will mess up their plans for success. He’s too restrained in general, though. Guddu may be a bit boring in his aspirations to the middle class, but that’s believable. However, Charlie seems a little naïve and out of his element. When his best friend celebrates what may be the biggest deal of their lives by losing his mind on cocaine, Charlie abstains. Sweety and the two brothers have character layers that are dead ends – the stuttering and lisps that are the bedrock of the promotion campaigns (“Difcover Your Mean Fide”) function as gimmicks. They aren’t explored much, except as a source of ridicule from thugs. At the screening I saw the tics elicited unselfconscious laughter from the audience, which is perhaps a social commentary the director may not have intended. Lisps are funny to the goons onscreen and the audience – are they meant to be compared? There’s a bit of migrant bashing thrown in (referring to people from UP who move to Mumbai) in what might be an attempt to comment on Indian society or xenophobia in general. It too seems like an unfinished thought, as does a comparison between twins and diamonds. And what’s with horses? Charlie has some connection that goes beyond his dream to be a bookie at the track, and if you figure it out, please let me know. I hope it isn’t in the vein of Peter Shaffer’s “Equus.” Maybe some mysteries remain deliberately unsolved to make the story stick with you, and maybe someone lost track of continuity. The expert camera work is something to admire, but of a fashion that keeps the audience at a detached distance. “Dhan Te Nan,” depicting a temporary triumph, is supposed to be exciting, and while you’ll know this in your head, the feeling doesn’t translate. Color, strobes, and rapid cutting render it less emotionally immediate. If the viewer is at all familiar with dramatic tragedy structures, you’ll predict that all the disparate groups will come together and that in time confusing will give way to connection. You’ll also anticipate that even with happy intervals, nooses are slowly being tightened and that not everyone is going to come out unharmed or even alive. The denouement slowly unfolds, but the final update is tersely depicted, almost as an afterthought, and it follows a rather predictable filmi pattern. There’s a difference between walking the right path and going in circles on the racetrack. A lot of quality elements in some unusual places will likely entertain throughout. Whether you’d watch it again is not a sure bet.